RICHMOND, Calif. -- The Chevron Corp. oil refinery takes up 15 percent of this industrial city, and company billboards line the nearby streets. It's one of the biggest petroleum processors in the state, and Chevron wants to add the capability to refine dirtier oil. Activists here want to stop that and the state rules that they say are allowing it. On a very basic level, they say, California's climate policies are deeply flawed, as reflected by the fact that Chevron just received a permit to expand hydrogen production in order to refine greater volumes of oil. "The Chevron expansion is covered by cap and trade and will most likely be carrying dirty crude from the Bakken Shale," said Jeff Conant, an international forest campaigner with Friends of the Earth. "It's the exact opposite of what is needed both locally and globally." As California continues on its path to lowering greenhouse gas emissions, and interest groups rekindle the debate over its particulars, environmental justice groups are trying to walk a fine line between defending existing climate policies and trying to reshape them. 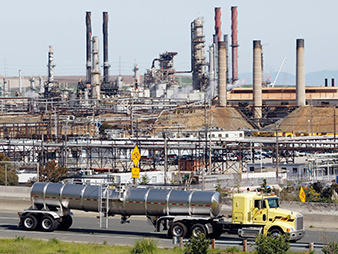 Chevron oil refinery in Richmond, Calif. Photo courtesy AP Images. Formerly bitterly opposed to cap and trade, the state's marquee policy for reducing greenhouse gases, the groups are now among the beneficiaries of the market's revenues, which have reached $833 million since beginning auctions in late 2012. They are still philosophically opposed but now find themselves defending it in practice. "In some ways, it's not 100 percent bad to price carbon, but it's also not 100 percent good, so we're in these gray areas," Mari Rose Taruc, state organizing director for the Asian Pacific Environmental Network (APEN), said at an environmental justice conference last month in Richmond. Chevron's planned expansion, which got the green light from the Richmond City Council at the end of July, would replace the refinery's existing hydrogen plant with one that could produce about 30 percent more hydrogen, which is used to process high-sulfur crude and gas oils. The project would also upgrade a portion of the refinery to protect it against the corrosion caused by high-sulfur crudes. Chevron officials wouldn't disclose where the oil would be coming from specifically. The refinery is already one of the top three emitters of greenhouse gases in the state, at about 4.6 million metric tons of CO2 equivalent per year. The new hydrogen plant, which uses natural gas, ammonia and other gases as fuel, would expand the refinery's emissions footprint, but Chevron is planning to pursue other emissions reductions, including possibly ramping down fuel production to 86 percent of capacity, in order to accommodate the increase in emissions from the hydrogen plant. Thus, Chevron says, the expansion will not generate any more greenhouse gas emissions, or other pollutants, than are already produced. Environmental groups say the projections are unrealistic and that Chevron's partner operating the hydrogen plant, Praxair Inc., is likely to export extra hydrogen to other refineries, thus increasing the project's emissions profile. Chevron concedes that that may happen, to the tune of 555,000 tons of CO2 per year, and says Praxair may buy cap-and-trade credits to cover any emissions above the base line. "Chevron's EIR [environmental impact report] divides things up in a weird way and basically plays a shell game with the emissions," said Greg Karras, senior scientist with Communities for a Better Environment. "It enables emissions from production of oil, burning gasoline in tailpipes, all of that. It wouldn't happen if the fuel wasn't being refined." As well, they argue that Chevron should be lowering emissions by investing in what they call a "Clean Energy Jobs Program" in Richmond and nearby towns that would be controlled by the communities and would include energy conservation, efficiency, public transit and other alternatives to cars, distributed solar, energy storage, and infrastructure and rebates for electric vehicles. As part of the deal to let Chevron revamp its refinery, the city on July 29 approved an environmental and community investment agreement: $40 million in air quality monitoring, emergency response planning and retrofits to ships and refinery equipment to reduce toxic, smog-forming and greenhouse gas emissions; $10 million of local land for a 2-megawatt solar facility; and $80 million in direct payments to the city, including $30 million for local zero-emission transportation, urban forestry, rooftop solar and energy retrofit initiatives. That's not enough, community advocates say. "That's all small potatoes compared to protecting our climate, and Chevron's profits are huge compared to that," Karras said. "This project's still going to be running in 2050 unless the refinery blows up or electric cars get really cheap really soon." While the Chevron project epitomizes environmental justice groups' grievances with cap and trade, their stance is complex. EJ groups, as they are known, have a complicated history within California climate politics and cap and trade in particular. They sued the state in 2009 over the choice of the greenhouse gas market as a backstop policy to achieve the state's emissions target of 1990 levels by 2020, arguing that regulators hadn't fully analyzed the effects of the market. They said it would hurt low-income communities by allowing emitters to avoid local limits on greenhouse gases by buying credits or offsets. Reducing greenhouse gases locally would also help reduce "co-pollutants" like nitrogen oxides and particulate matter, which do affect the health of people living nearby. They won the suit, but all the California Air Resources Board had to do was go back and issue a new document rejustifying its choice of cap and trade. "What we wanted to see was more akin to direct regulation," said Marybelle Nzegwu, an attorney with Public Advocates Inc. who brought the suit. "The cap-and-trade program actually creates it so the covered entities decide where to make reductions, and what we've seen is ... polluting entities tend to congregate in certain areas where enforcement is lax and they know opposition is small." A major legislative victory in 2012 brought the groups closer to embracing cap and trade. State Sen. Kevin De León's (D) S.B. 535 reserved at least 25 percent of the proceeds for reinvesting to benefit poor communities. Affordable housing, renewable energy, energy efficiency and public transportation are among the spending priorities. This year, the first in which the money is being distributed, low-income communities are actually getting 31 percent, said Vien Truong, director of environmental equity at the Greenlining Institute. "This success results from de León -- who is now the incoming Senate leader -- championing policy that serves people and the planet. We must ensure that this precedent serves as a model as Gov. Jerry Brown (D) pushes to sign carbon-pricing pacts with other regional governments and countries," she said. "Whether it succeeds or it fails in California will determine if it's going to be replicated in other states or regions." Now, the environmental justice movement finds itself defending cap and trade. Groups came out strongly against a bill in July that would have delayed for at least three years the expansion of cap and trade to include in-state gasoline and diesel sales, which is currently slated to occur Jan. 1, 2015. Chevron is a member of three groups that supported the bill: the Western States Petroleum Association, the California Manufacturers and Technology Association, and the California Business Roundtable. State legislative leaders killed the bill, A.B. 69, late last month, saying there wasn't enough time to consider such a significant change (Greenwire, Aug. 26). "It's a not even thinly veiled approach that the oil industry is taking to sort of keep their kill-and-drill approach moving along," said Parin Shah, senior strategist with APEN. Earlier this year, though, they became involved in negotiations over a different bill that also would have exempted transportation fuels from the cap. Senate President Pro Tem Darrell Steinberg (D) proposed subjecting fuels instead to a carbon tax starting at $15 per ton -- an idea widely viewed as a non-starter among mainstream environmental groups, because it would dismantle the cornerstone of California climate policy, which is the firm cap on emissions through 2020. But APEN became involved because the group strongly supported Steinberg's spending plan for the revenue -- 40 percent of the money, including the cap-and-trade revenue, would have gone to affordable housing and "sustainable communities" projects that reduce greenhouse gas emissions, for instance by being built close to public transit (ClimateWire, April 15). Shah said the group's strategy was aimed at making the system simpler. "Our position was that a simple solution to putting a price on carbon and equivalents is the best road for us to take," he said. "So placing a cap and putting a price on carbon is the easiest thing to do." APEN withdrew from negotiations when it became apparent that the emissions cap would not hold firm, he said. The bill eventually turned into a spending plan for the cap-and-trade revenue, pieces of which made it into this year's final budget deal between lawmakers and the governor (ClimateWire, June 13). Steinberg proposed that a large chunk of the money go to affordable housing and "sustainable communities," with recipients competing for the money based on their greenhouse gas emissions profiles (ClimateWire, April 15). The coming fiscal year's budget includes $130 million for emissions-friendly housing and land-use planning. That was another major win for the movement, Shah said. "That is a gift that he left that is somewhat priceless, the ability for us to incorporate affordable housing into the metrics of measuring reductions." Coming up, EJ groups hope to address the use of offsets in the cap-and-trade system. Businesses can currently use them for up to 8 percent of their total emissions under the cap, in place of state-issued allowances. EJ groups say they're even worse than regular allowances because they could push emissions reduction benefits overseas and cause more land to become privatized, especially in developing countries like Mexico and Brazil that have signed carbon-pricing agreements with California. "This is the regime we're under with cap and trade in California," Shah said. "Are there ways to make it stronger so it addresses the needs of low-income communities or environmental justice communities? Yes. S.B. 535 totally does that. We've improved on the regime already and feel we can continue to do that by eliminating international offsets and eventually getting to the place where there are no offsets, or if there are, they're localized."